Topic: "The Great Firewall of China" BECOMES "The Great Cannon of China"
China has upgraded the website-blocking systems on its borders, dubbed The Great Firewall, so it can blast foreign businesses and organizations off the internet. Researchers hailing from the University of Toronto, the International Computer Science Institute, the University of California Berkeley, and Princeton University, have confirmed what we've all suspected: China is hijacking web traffic entering the Middle Kingdom to overpower sites critical of the authoritarian state. These sites may end up being overwhelmed and crash as a result – a classic denial of service – meaning no one in the world can access them. It is a clear case of China engineering a way to knock arbitrary websites off the internet for everyone, it seems. GitHub mitigated the assault to mostly stay online. 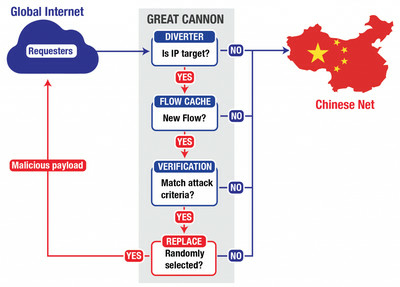 This weaponized firewall has been dubbed the Great Cannon by the researchers: https://citizenlab.org/2015/04/chinas-great-cannon/ , and typically hijacks requests to Baidu's advertising network in China. Anyone visiting a website that serves ads from Baidu, for example, could end up unwittingly silencing a foreign site disliked by the Chinese authorities. "In the attack on GitHub and GreatFire.org, the Great Cannon intercepted traffic sent to Baidu infrastructure servers that host commonly used analytics, social, or advertising scripts," the university researchers explained in a blog post on Friday. The researchers note that the Great Cannon and Great Firewall are very similarly structured, with both taking internet traffic either coming in or going out of the country and analyzing it before either passing on or redirecting the traffic. The researchers are also convinced the Chinese government is directly behind the Great Cannon's operations. They note that the Great Cannon and Great Firewall are located in facilities run by state-run Chinese ISPs. "Deploying the Great Cannon is a major shift in tactics, and has a highly visible impact," they wrote. "It is likely that this attack, with its potential for political backlash would require the approval of high-level authorities within the Chinese government."